The first race that Sydney Flying Squadron took part in was on 24 October 1891. Mark Foy’s 20 footer “Kannanook” and champion sailor, Chris Webb’s “Mantura” took part in the race. Mark Foy was a successful businessman known for the department store “Mark Foys”. Today at the Sydney Flying Squadron the restaurant is named “Foys Restaurant”. The Squadron’s boats were banned from the 1892 National Regatta because they carried coloured emblems. It was claimed that the emblems encouraged gambling and spoiled the look of the white sails on Sydney Harbour. The Squadron men had little money, free few days, enthusiasm and skill. They were fearless and rebellious. 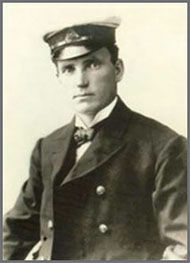 Mark Foy was determined to fight on behalf of the Squadron. He wanted to make sure that skiff sailing was enjoyed by everybody regardless of their financial and social background. He organised an opposition regatta and financed the advertising and engaged a lorry to parade the streets with a calico sign. He also donated the whole prize money. The Sydney Flying Squadron sails today holding to Mark Foys’ concepts. Today the SFS’s sailors, men and women, are also fearless and enthusiastic! The boats racing today are replicas of the wooden boats that have sailed Sydney Harbour (or the Brisbane River) since the 1890s. Some modern 18-Footers participate as well in the races. A dedicated spectator ferry follows the races every Saturday during the sailing season. In earlier days, rugby league and rugby union players sailed on 18-Footers over the summer months to keep fit for their winter football codes, hence the rugby jersey team uniforms still worn by the crews on the skiffs. For example, rugby legends of the day such as the Norman brothers played first grade rugby with South Sydney were crew members at the Sydney Flying Squadron during the sailing season when the rugby season was over. It is no accident that The Men of League chose the Sydney Flying Squadron to announce their 100 greatest rugby league players as part of the Centenary of Rugby League on 22 February, 2008. The Sydney Flying Squadron is part of Australia’s and Sydney’s sailing history and the photographs adorning the walls at the Club are testimony to its rich history.